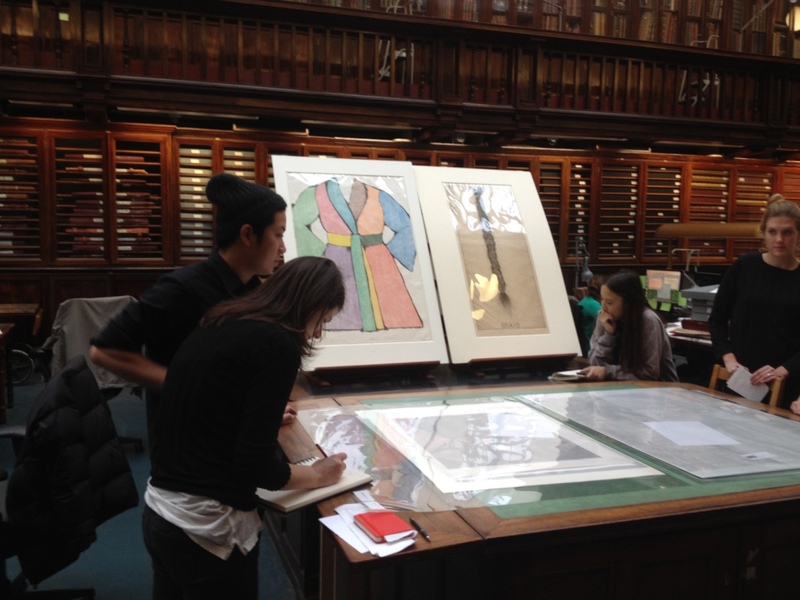 On Wednesday 4 November CCW Professor Paul Coldwell brought a group of students from Camberwell College of Arts to the British Museum to work with their new collection of Jim Dine prints. Coldwell said, ‘As a taster in advance of my in conversation with the American artist, Jim Dine on 25th November, 6-8pm, I arranged an informal seminar with ten students from MA Printmaking at Camberwell in the beautiful Prints & Drawings study rooms of the British Museum. Dine recently gifted over 200 prints to the British Museum in honour of his dealer, Alan Cristea. For anyone interested in contemporary printmaking, this is a rich resource, not only to enable an in depth study of this remarkably printmaker, but also to see close up, the wide range of techniques that he has employed, and in some cases invented. There is no substitute for seeing prints “in the flesh” and having such an open and rich resource makes studying in London so special. This entry was posted in Staff, Students and tagged Alan Cristea Gallery, British Museum, Jim Dine, Paul Coldwell, printmaking, prints on November 16, 2015 by Claire.